Many escape to the Maldives to experience a getaway unlike any other. With crystal blue water, hotels that seamlessly float on water and a surplus of serenity, a trip to this idyllic destination will relax both your mind and soul. Now, one of the island’s most esteemed resorts, the Conrad Maldives Rangali Island, is adding yet another luxurious reason to jetset to the island: the chance to fall asleep in an underwater suite. The Muraka Suite, which translates to “coral” in the island’s native language Dhivehi, will be unveiled later in the year after undergoing a $15 million renovation. The Muraka will allow guests to indulge in every aspect the Maldives has to offer, including its vast marine life. While guests who travel to the islands can go diving to experience this, not many have the opportunity to see it every hour of the day, if they so choose, by simply stepping foot into their sleeping quarters. Whether you’re traveling to the Maldives alone or with additional couples, the Muraka room can accommodate up to nine people comfortably. Spanning two floors, the Muraka room’s upper level features luxurious amenities including a king-sized bedroom and bathroom, powder room, gym, butler’s quarters, private security quarters, living room, kitchen, bar and dining area, and an additional twin-sized bedroom. The most stunning aspect is when guests travel down the spiraled staircase into the suite’s lower level, which sits about 16 feet below sea level. 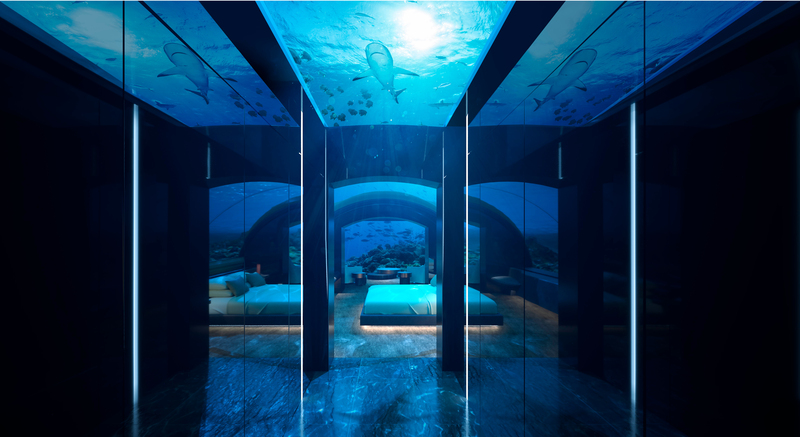 On this level, guests will experience serenity as they view the Maldives’ marine life swim past each room. This level features a king-sized bedroom, living room and bathroom. To stay abreast of any additional happenings surrounding the Muraka room at the Conrad Maldives Rangali Island, visit www.conradmaldives.com.